The deadly US airstrike on an Afghan hospital has been downplayed by Washington as a “tragic mistake” committed in the “fog of war”. 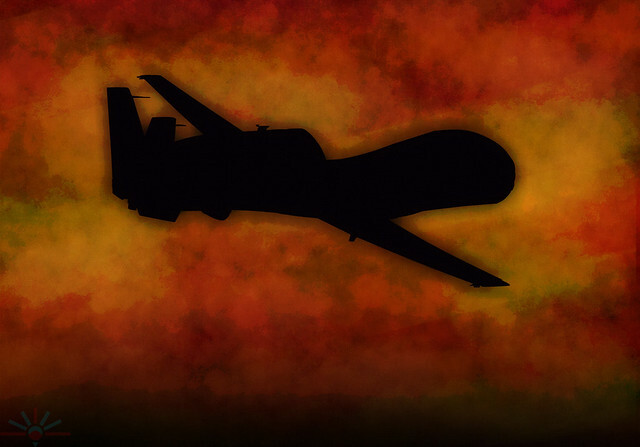 But recently disclosed documents on the secret policy of drone assassinations by the Pentagon reveals a cold-blooded calculus to “kill all” within a designated strike zone, even resulting in 90 per cent “collateral damage” of “unintended targets”. The US airstrike on the Kunduz hospital did not reportedly involve unmanned aerial drones – it was carried out by a warplane. Nevertheless, the same mentality of wiping out non-combatants to “finish” an intended target seems to have been at work. The director of the medical charity whose hospital was hit by the US warplane has said that the attack was a “premeditated massacre” and amounts to a war crime. The official line from Washington is that the strike on the hospital was a “mistake” and that the death of civilians was a tragic case of “collateral damage”. But evidence points to a deliberate attempt by US forces to take out suspected targets within the facility – even if that meant killing all inside the hospital, including civilian patients and medical staff. Meinie Nicolai, the president of Doctors Without Borders, said the facility near Kunduz in northern Afghanistan was targeted with “deliberate intent” by US forces. The bombing and heavy cannon strafing of the hospital on October 3 by an American AC-130 warplane resulted in 22 dead and dozens others seriously injured. Three children were among the fatalities. The Intensive Care Unit appeared to be the focus of the attack, as other buildings in the complex incurred much less damage. US military and their Afghan coalition partners in the locality were given clear GPS coordinates of the hospital, the only major facility in and around the remote city of Kunduz. The last forwarded coordinates for the hospital was made on September 29 – the day before the attack – according to the doctors. Even as the airstrike was being carried out, hospital staff made frantic telephone calls to the US forces alerting them of the “mistake”, but the bombing and firing continued for at least another 30 minutes. The medical charity, also known by its French name Medecins Sans Frontieres (MSF), is calling for an independent international inquiry into the incident – one of the worst single civilian death tolls in the 14-year-old US-led war in Afghanistan. Washington has refused to comply with the request for such an independent probe, saying that its Department of Defence is conducting its own investigation about what happened. The Pentagon’s credibility to come clean was undermined this week after a US tank forced its way into the charred hospital compound. MSF has accused the United States military of “destroying evidence” at the site. What were US forces looking for when they violated – for the second time – the grounds of the hospital? Could they have been trying to retrieve the body of a Pakistani Taliban operative whom they claim was hiding in the facility? The Pakistani man was reportedly acting as an intelligence agent helping to coordinate Taliban insurgents fighting against the US-Afghan coalition forces. MSF officials and their local staff have strenuously denied that the facility was being used by Taliban fighters. Doctors and a security guard working at the hospital said that on the night of the attack there was no fighting near the medical compound. MSF has also categorically rebutted initial claims that Taliban militants were using the facility to launch attacks on US or Afghan forces. The international aid agency has confirmed too that none of its staff in Kunduz were Pakistani nationals. MSF has said, however, that its hospital – as with all its international facilities – had a normal policy of treating unarmed combatants as well as civilians. It noted that under international law all individuals are entitled to medical treatment, including combatants. The hospital in Kunduz conducted a strict policy of ensuring that patients are admitted on condition that they are unarmed and that any weapons that might be in the possession of wounded combatants are excluded from being taken into the facility. A report by Associated Press this week said that the hospital in Kunduz was being monitored by US military intelligence during the days before the airstrike. The incident occurred only a week after the Taliban made a spectacular military gain by taking the city – which was seen as a huge propaganda blow to the US-led Afghan forces. If the US military believed that Taliban fighters or the alleged Pakistani operative were being treated in the MSF hospital then the decision to launch a strike on the facility may have been made to take out the targets regardless of the civilian casualties. That scenario contradicts the statement by General John F Campbell, the top US commander in Afghanistan, who claimed that the strike was a mistake and that his forces would “never deliberately target a civilian facility”. Washington’s official account of the incident has flipped suspiciously. Initially, the US claimed that it was unaware that the facility was a hospital, then it changed tack and said that its forces on the ground had come under fire from Taliban militants in the vicinity, for which the AC-130 air gunship was called in. That version of events has been firmly contradicted by staff at the hospital who said there was no militant action in the surrounding area that night. Moreover, the MSF medics say that the warplane made several attack runs over the hospital before it finally launched its deadly firepower. On a separate but pertinent issue of US military policy was a report on October 16 by The Intercept on the secret use of assassination drone strikes. The information was based on a whistleblower’s in-depth knowledge of Pentagon drone operations in Afghanistan, Somalia and Yemen. Those operations are overseen at the highest level of US government, with President Obama being the ultimate authority to sign off on assassinations. Relevant to the Kunduz massacre is the policy of “find, fix and finish” which Washington’s drone “assassination complex” employs. “The White House and Pentagon boast that the targeted killing program is precise and that civilian deaths are minimal. However, documents detailing a special operations campaign in northeastern Afghanistan, Operation Haymaker, show that between January 2012 and February 2013, US special operations airstrikes killed more than 200 people. Of those, only 35 were the intended targets. During one five-month period of the operation, according to the documents, nearly 90 percent of the people killed in airstrikes were not the intended targets”. In other words, Washington – both the White House and Pentagon chiefs – are using a “kill them all” policy, whereby high levels of civilian casualties are deemed acceptable in order to neutralise an individual suspected combatant. The Kunduz hospital hit was reportedly carried out by an AC-130 gunship, armed with missiles and Gatling-type machine-guns, heavy enough to penetrate brick walls. Drones were not apparently involved, but the operation was conducted in the same northeast area of Afghanistan where US drones are used with a policy of “kill them all”. US General John F Campbell has acknowledged that the Kunduz hospital strike was carried out “within the US chain of command”. The stark conclusion is that the hospital was bombed and strafed by US forces to take out a suspected militant at the facility, with the deliberate knowledge that civilians would also be taken out in the operation. That puts the prima facie war crime at Kunduz in a totally different and much more serious context, going right up the highest level of culpability. It said the strikes continued for more than 30 minutes after US and Afghan authorities were told of its location. US forces were carrying out air strikes at the time. The Nato alliance has admitted the clinic may have been hit. At least 37 people were seriously injured, 19 of them MSF staff. Médecins Sans Frontières (MSF) is an international, independent, medical humanitarian organisation that delivers emergency aid to people affected by armed conflict, epidemics, natural disasters and exclusion from healthcare. Doctors Without Borders presses ahead with its demand for an independent inquiry into a deadly US strike on its hospital in Afghanistan. The international president of the medical charity slammed the US attack in Kunduz as an assault on the Geneva conventions. Joanne Liu, who received an apology from US President Barack Obama on Wednesday, stressed that she cannot rely on a probe by the US, NATO, and Afghan forces. US Executive Director of the MSF, Jason Cone, also slammed the US Defense Department for the attack. He accused the department of having violated its own manual governing the rules of war by failing to give the MSF a prior notification of the strike. At least 22 staff and patients were killed in the Saturday morning strike on the MSF hospital in Kunduz. This entry was posted in Afghanistan, All Posts News Politics and-or Videos, Dandelion Salad Videos, Human Rights, Politics, War Crimes and tagged Drones, Finian Cunningham, Kill List, Kunduz Hospital, Meet the new boss the same as the old boss, MSF Doctors without Borders, Phyllis Bennis. Bookmark the permalink. If any real (not fabricated) war-crime has allegedly occurred, is it not the proper duty and responsibility of a bona fide international criminal court to investigate, even if the US and its cronies have the outrageous gall to claim (spurious) exemption? If not, then why on Earth do we even have this purported criminal court? And should not their mandate be retroactive, unlimited? For something so serious, can there be any possible justification for some arbitrary statute of limitation? Or perhaps there is already a legal argument suggesting that the prerogative of the court should begin with its inception. Whatever the fine points of precedent and protocol, the point is to hold perpetrators of iniquitous acts accountable, by whomsoever and, no matter where they have occurred. I’d say that unless or until we take this extremely seriously, global governance in all its diverse manifestations remains profoundly threatened. How many “red lines” have to be crossed, before the world erupts in definitive outrage? The challenge is to create and empower institutions or orders, with the demonstrably legitimate mandate to exercise true authority through consensual intelligence. NATO has failed; regulatory agencies are tokenist puppets, infiltrated by ecocidal interests; the US judiciary is a laughing stock blackmailed into conspicuous irrelevance; PR disinformation dominates all discourse as the UN struggles with its interminable bureaucratic entanglements & competitive hierarchies; while the deep state of universal covert intelligence is irreparably corrupt, and thus ideologically compromised by sinister cliques and cults. So, who will watch the watch-dogs, and who is really capable of exercising true biospherical integrity in a confused and confusing world where sophisticated piracy is the rule, and barbarism is extolled as the highest form of pragmatism? Bombing hospitals is US policy, not accident, in violation of the Geneva Accords. They are referred to as “soft-kills” by the military In Vietnam, north Vietnam took the signs off the roof of hospitals and medical facilities because they drew bombers. The only difference here was that this was a Western Doctors without Borders installation. But previously the Doctors had argued that the TPP would be bad for medicine, no doubt angering Obama. But deliberately bombing a Western facility is a definite step down in USA decay.